Scores of residents were hurt, one death was reported and dozens who fled had not been located by last night, though they were presumed to be alive. Officials said an earthen-wall shield between the blast and a nearby apartment complex, and a gap of 7 to 10 precious minutes before flames reached the complex, averted a disaster that might have cost many lives. The enormous orange fireball and flames that roared out of control for hours sent 1,500 nearby residents fleeing in terror, leveled eight apartment buildings and damaged a half-dozen others, melted cars and playground swings, shook the ground for miles around and illuminated the night sky from New York to Pennsylvania. But miraculously, officials said, no one was known to have been killed directly by the blast. A 32-year-old woman who lived in one of the destroyed buildings died during the upheaval, apparently from a heart attack. Her name was not released. 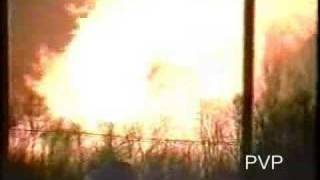 A 36-inch-diameter natural gas pipeline, Line 20, owned and operated by Texas Eastern Transmission Corporation (TETCO), failed catastrophically on March 23, 1994. The ruptured portion of the buried pipeline was on the property of Quality Materials, Inc., (Quality). Escaping gas from the pipeline was ignited within minutes after the rupture, sending flames several hundred feet into the air. Radiant heat from the burning gas ignited a fire at the Durham Woods Apartment Complex, located more than 100 yards from the rupture site. The fire destroyed several buildings on the west side of this apartment complex. Estimated damage from the accident exceeded $25 million. No fatalities resulted from the accident. So they didn’t count the woman who dropped dead of a heart attack. All of you now suffering anxiety and distress from the threat of imminent domain on your property: you’re just collateral damage that won’t even be counted. Parties to the investigation were the Middlesex County Police Department, TETCO, the Office of Pipeline Safety (OPS) of the Research and Special Programs Administration, the New Jersey Bureau of Pipeline Safety, and Edison Township. All having to spend tax dollars to deal with Spectra’s explosion. As a result of its investigation, the Safety Board determined that the probable cause of the pipeline rupture was mechanical damage to the exterior surface of the pipe that reduced the pipe wall thickness and likely created a crack in the gouge that grew, most likely through metal fatigue, to critical size. Petitioner is not disputing the probable cause of the accident. Spectra damaged their own pipeline, found the damage on inspection, claimed it wasn’t significant, and years later the pipeline blew up at that location, causing more than $25 million in property damage, 100 people to be burnt or “felled by smoke”, 2,000 people to be evacuated, 300 people to be made homeless, and one woman to be scared to death, literally. One of the Safety Board’s findings was that TETCO’s Line 20 was gouged by excavation equipment, such as a backhoe, at an undetermined time after the pipeline was internally inspected in 1986. Petitioner has requested that the Safety Board modify or reconsider this conclusion. In support of his petition, petitioner submitted an August 31, 1995, report and a September 11, 1995, affidavit, both prepared by Mr. H. Noel Duckworth, petitioner’s consultant. In his affidavit and report, Mr. Duckworth contends that the dent containing the gouge that was determined to be the point of origin of the rupture was, in fact, reflected on the 1986 internal inspection survey logs. Mr. Duckworth identified a four-channel signal on the copies of the 1986 survey logs that he presented to Safety Board staff. This four-channel signal is approximately 62 inches upstream from the girth weld (reference point), at a position of about 1:45 o’clock circumferential (# 21, Exhibit I-2). Mr. Duckworth contends that this four-channel signal reflects defect 21, the point of origin of failure. So Spectra already knew the pipe was damaged and did not fix it. Sterling safety record? The findings from TETCO’s 1986 magnetic flux internal inspection did not indicate metal loss sufficient to have caused pipe failure. Witnesses recall and aerial photographs show heavy equipment, including a bulldozer and dredging equipment, being operated in the area of the sediment pond over the pipeline before TETCO’s 1986 internal inspection of Line 20. The metal loss indications on the 1986 log corresponds with minor scrape marks on the pipe within the pond. The Safety Board concludes that the indications detected in the 1986 internal inspection were the deeper portions of scrapes made when plant employees bulldozed plant debris and dirt into the sediment pond and when dredging equipment contacted the pipe during sediment removal operations. The Board further concludes that the gouge that ultimately resulted in pipe failure was caused by excavation activity performed at some undetermined time. Didn’t look bad enough to us, boys! The gouges on the pipe were not the result of recent excavation damage. The Safety Board examined the microstructure of the pipe material underlying the non-rupture origin crack and found it was heavily deformed and contained a crack covered with corrosion deposits. The large build-up of corrosion deposits in the non-origin crack indicates that the crack was present in the pipe metal for some time, likely from when the pipe was gouged. The Safety Board examined the microstructure of the pipe material underlying the non-rupture origin crack and found it was heavily deformed and contained a crack covered with corrosion deposits. The large build-up of corrosion deposits in the non-origin crack indicates that the crack was present in the pipe metal for some time, likely from when the pipe was gouged. The dent alone didn’t cause the rupture. But the dent collected corrosion deposits that may well have caused the rupture. The mechanically-induced gouge at the rupture initiation likely created a crack in the gouge that grew to a critical size, most likely as a result of metal fatigue. Although many TETCO requirements and procedures surpassed those required by Federal regulations, the companyís surveillance procedures did not stress that employees identify excavation activities within industrial locations that could endanger its pipeline. TETCO’s lack of automatic- or remote-operated valves on Line 20 prevented the company from promptly stopping the flow of gas to the failed pipeline segment, which exacerbated damage to nearby property. The public will not benefit from the safety improvement recommendations developed in RSPA’s public safety risk study without guidance containing implementation procedures and without motivation from associations representing local governments. Hear that, county commissions, city councils, Association of County Commissions of Alabama (ACCA), Alabama League of Municipalities Florida Association of Counties, Florida League of Cities, Florida City and County Management Association (FCCMA), Association of County Commissioners of Georgia (ACCG), and Georgia Municipal Association (GMA)? NTSB says it’s your responsiblity to motivate implementation of pipeline safety procedures.